We use the latest computer diagnostic tools and various tests to accurately diagnose problems with your truck. We know that your time is valuable and we will work hard to fix your vehicle's issue so you can get back to work quickly without losing additional valuable time. To determine exactly what your brakes require, our technicians will perform a mechanical inspection of your complete braking system as well as a road test to confirm the condition. We’ll do a system diagnostics of your electrical System in the problem area to identify and locate the electrical malfunction. Is your Check Engine Light on? It’s time for a trip to the Engine Repair professionals. 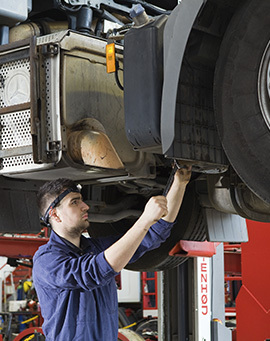 Let our technicians get your truck engine running like the day you bought it. Today's trucks use many different types of suspension. Many are equipped with air ride suspensions or combination air ride/spring suspensions we can troubleshoot all suspension types. A preventive maintenance program are periodically checked and adjusted to maximize the life expectancy of all components and insure the drivability of the complete unit as a combination. We pride ourselves on our professionalism and quality of service. Our goal is to get you back on the road safely and quickly.